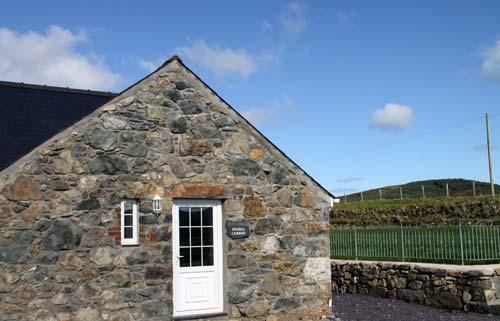 Our old stone farm buildings have been sympathetically converted into three comfortable holiday cottages, each one with its own particular character and style. Original pitch pine beams and trusses show scrawled dates varying from 1894 onwards. We have kept as much as possible of the original layout of the buildings and here and there a few exposed stone walls still remain - contributing to maintaining the original character. 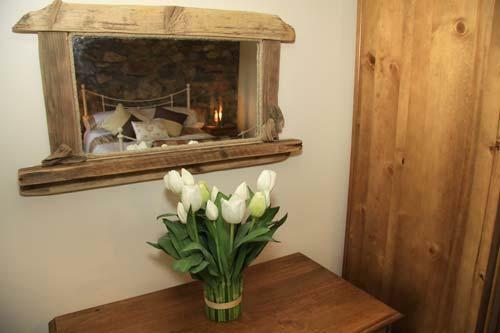 Slate floors and high quality leather and pine furniture with a few traditional iron beds complement the setting. Don't be mistaken into thinking that you are stepping back in time for your holiday though. All the cottages have microwaves and dishwashers, large flatscreen tvs with dvd players, free and unlimited internet access and Nintendo Wii to keep the children happy. All the cottages benefit from oil underfloor heating on the ground floors and radiators on the first floors. 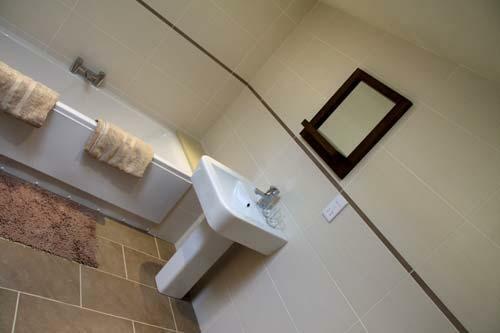 There is a choice of shower or bath in each cottage with heated towel rail. All crockery, cutlery, kitchen equipment, bedlinen, towels, tea towels etc are provided within the price, but please bring your own beach towels. 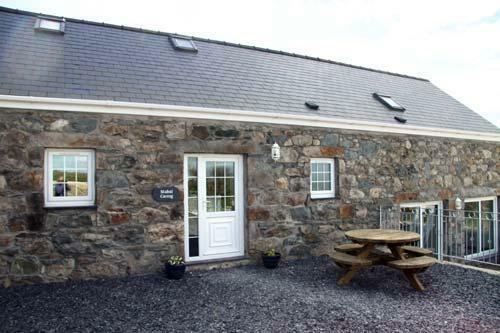 Stabal is our largest cottage sleeping 8 in four bedrooms. 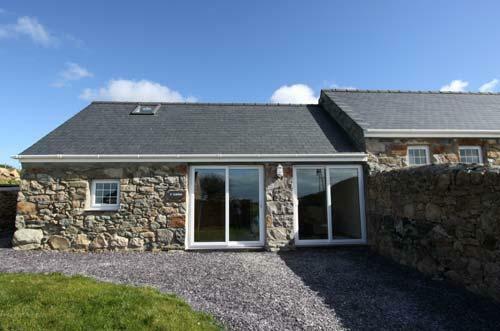 Formerly the farm stables, Stabal is full of character with its oak kitchen and slate floor. 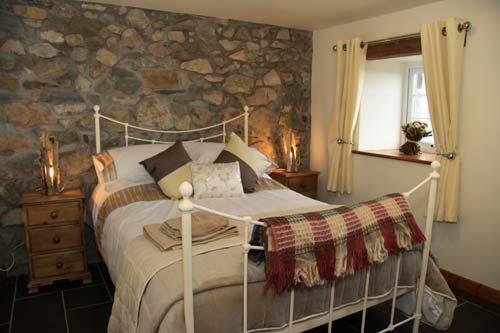 The old cart room is now a luxury double bedroom with its' own patio area. 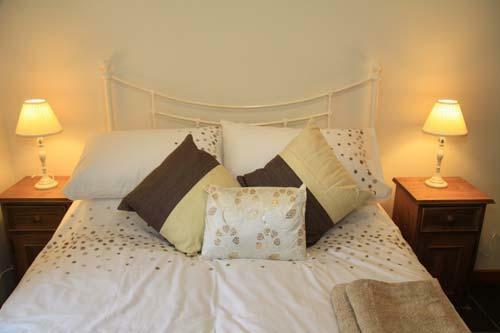 The old servants' quarters is also a beautiful double room with wooden sleigh bed. Children will love the twin rooms (croglofft) with sloping eaves and interconnecting door whilst Mum enjoys the freestanding bath. 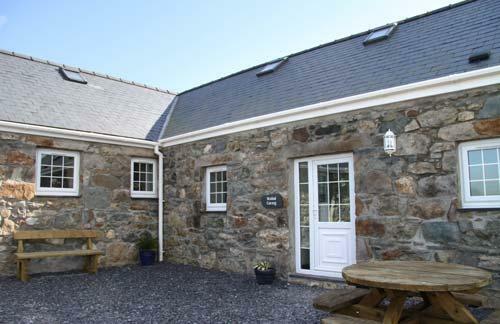 Beudy Carrog sleeps 6 in three bedrooms, two double rooms on ground floor and twin room upstairs. Enjoy fabulous sea view from Beudy - on a clear day you can see Ireland. Put your feet up in the comfortable and spacious lounge with wood flooring. Bath and wet room shower. 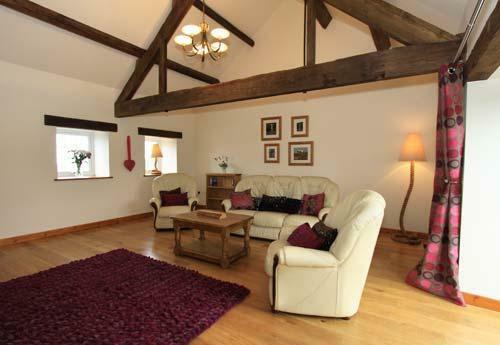 Children can enjoy the 'snug' upstairs with their own tv, dvd player and Playstation 2 and huge leather bean bag. 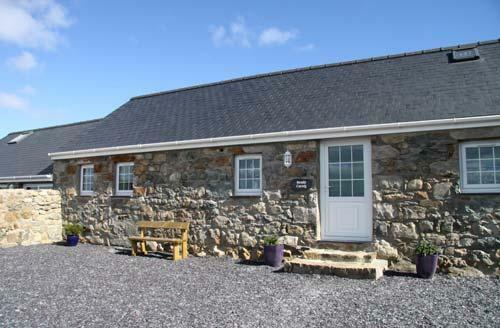 Y Gorlan is our most popular cottage sleeping 4 in two bedrooms. Cosy and sheltered it boasts a set of curved stairs leading from the living area to the 'croglofft' above. With its own secluded garden area it can be your hideaway for a week or weekend. Ideal for pets as it has a secure garden. There is a large shared lawned garden to the rear of the properties for everyone's use. Benches are provided so you can sit and enjoy your coffee while the children play. There is ample space for car parking and an additional parking area if required for trailers, boats etc. A wash-room on site provides you with the use of a washing machine and tumble dryer for no additional charge.